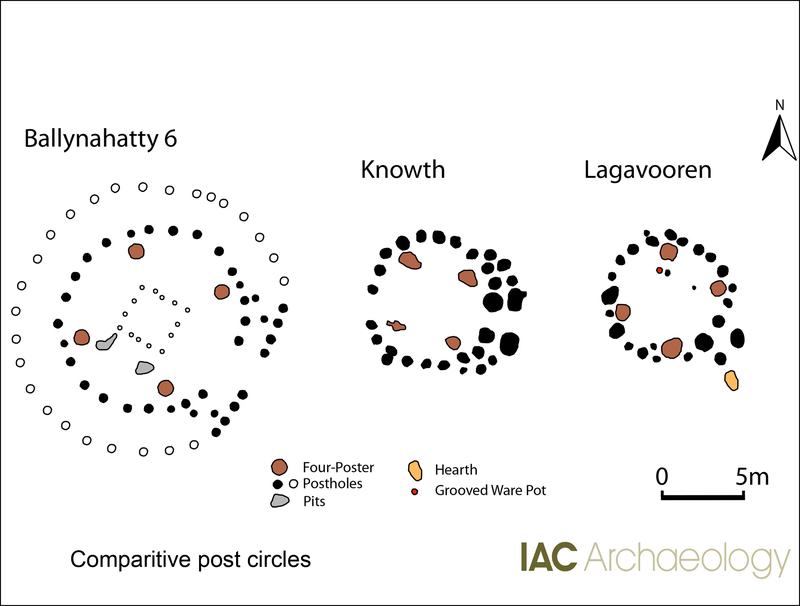 In the second of a series of articles on excavations undertaken in advance of the Drogheda Bypass (Platin to Oldbridge Section) Fintan Walsh describes a fine example of a late Neolithic timber circle discovered at Lagavooren with similarities to the one at Knowth, 7.5km to the west, in the Brú na Bóinne complex. Lagavooren 7 was excavated by Emmett Stafford in early 2001. The multi-phased site at Lagavooren 7 was one of the standout sites of this scheme. Not only did it have the timber circle but there was also evidence for early Neolithic activity (pits with pottery); an early/middle Bronze Age pit; a middle Bronze Age house; a middle/late Bronze Age well with preserved timbers at its base and sides; and Iron Age activity comprising two smelting hearths that contained iron slag, one of which returned a date of 520–380 BC (with a 50.7% likelihood of it dating to between 420–385 BC). This date is very significant as it places the smelting activity here in the period 600–400 BC—the very onset of iron smelting in Ireland. 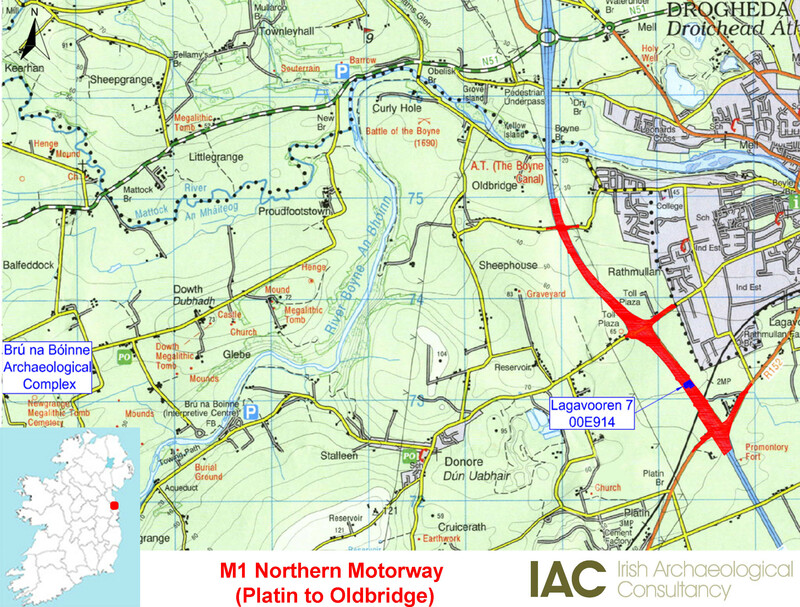 Lagavooren 7 is positioned within, and is a major component part of, a huge late Neolithic and Bronze age habitation and ceremonial complex identified during the Northern Motorway project in the townlands of Rathmullan and Lagavooren. 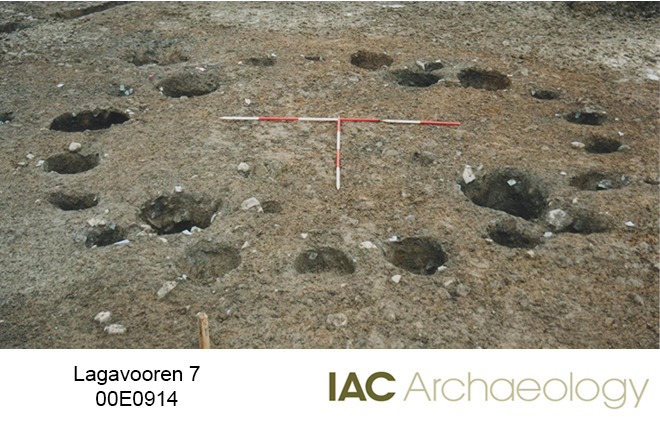 Of particular note is the identification of a large late Bronze Age (1040–810 BC) ditched enclosure (Lagavooren 6) which was located immediately to the south-southeast (Clarke and Murphy 2002). This site was only partially excavated and the remnants were preserved in situ under the motorway. Further late Neolithic activity in the immediate area was excavated at Rathmullan 7 c. 110m to the northwest where a pit contained large quantities of late Neolithic Grooved Ware pottery including an almost intact vessel. The pottery has been interpreted as a possible votive deposit and is paralleled by a large deposit of Grooved Ware pottery in a pit at nearby site Rathmullan 8 which was located c. 740m to the northwest of Lagavooren 7. The advent of timber circle construction represented a new type of architecture in Ireland associated with the appearance of Grooved ware pottery around 2900 BC. These monuments are traditionally interpreted as having a ritual function, and may have been the focus of elaborate ceremonies attended by large groups of people. The timber circle at Lagavooren was defined by a circuit of 23 regularly spaced postholes. The circle had an internal diameter of 5.7m and an external diameter of 7m and there were four large post-pits in the interior and an entrance feature/porch to the southeast. The fills and deposits associated with this structure produced a large lithic and ceramic assemblage which included numerous flint flakes, blades and scrapers and a large Grooved Ware assemblage comprising at least nine vessels. A series of radiocarbon dates (all burnt animal bone samples) obtained from the postholes (2900–2670 BC (4205+/-30 BP), 2840–2470 BC (4050+/-30 BP), and 2580–2460 BC (4005+/-30 BP)) confirms—in conjunction with its direct association with Grooved Ware pottery—a late Neolithic date. The distribution of pottery was also interesting. Sherds from four separate late Neolithic Grooved Ware vessels were recovered from the fills of more than one posthole. At least one sherd of each of these vessels was also recovered from internal square four-post setting’s postholes while a sherd from two of the vessels was recovered from an entrance post-pit. Sherds from one of the vessels (Vessel 10) were actually found in eight separate postholes. This is clear evidence of deliberate and ritual deposition during the construction of the monument. In addition to all this the shattered base of a Grooved Ware pot was identified inside, in the northwest corner of the timber circle. It was discovered lying directly on subsoil with no surviving evidence of a cut. The timber circle at Knowth (positioned 12m east of the entrance to the main passage tomb) is an excellent parallel for Lagavooren 7, although Knowth is a slightly larger example—9.11 x 8.1m externally with an elaborate entrance area and four large post pits defining a rectangular area in the interior. Like at Knowth, the internal post-pits at Lagavooren were the most substantial in the structure. A large quantity of flint and Grooved Ware pottery was uncovered from both. The pottery recovered from the Lagavooren timber circle was heavily worn and was clearly redeposited from earlier contexts such as rubbish pits or middens and this contrasts with the Knowth evidence where fresh edge breaks and surfaces indicate that the pottery had been deposited immediately after breakage (the pottery was analysed by Eoin Grogan and Helen Roche). It is clear however that the deposition of the pottery at both sites is likely to have been ritual in nature. 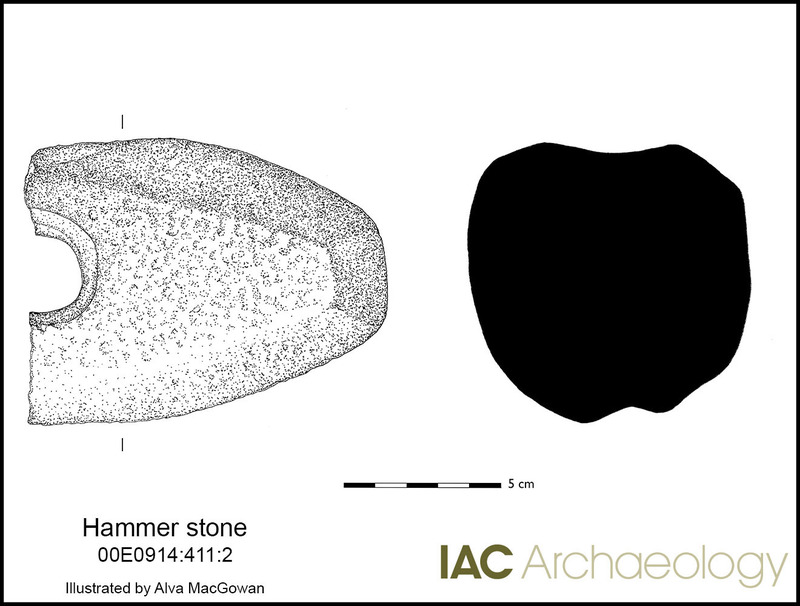 A further indication of ritual deposition in the Lagavooren timber circle was the recovery of a polished stone axe from one of the four internal post-pits while a broken axe-hammer was found in a pit just to the east of the circle. 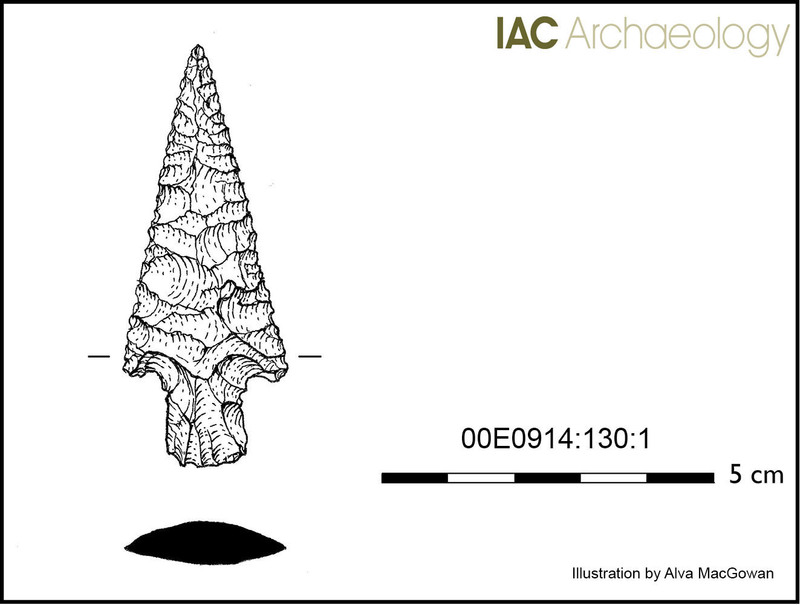 A beautiful barbed and tanged arrowhead was also found in a hearth just at the entrance to the structure. Although these monuments are often associated with ceremony and burial only very small amounts of burnt bone identified as “possible human” were recovered – just 3.3g in total. The Lagavooren timber circle is one of many such monuments that have been discovered throughout the Irish landscape, indeed there are other notable examples in this part of the country which include the circle at Bettystown on the Co. Meath coast (Eogan 2000) and one of the late Neolithic structures (Structure C) at Balgatheran which is just across the Boyne to the north from Lagavooren (Ó’Drisceoil 2009). One of the inner, smaller, circles at the huge late Neolithic timber circle complex at Ballynahatty, Co. Down comprised a double row of posts 16m in external diameter (Ballynahatty 6). This enclosure contained an inner setting of four large posts and, within that, a further square setting of 14 smaller posts (Hartwell 2002). This arrangement is similar but much larger and more impressive than the Knowth and Lagavooren examples. Nevertheless there is a striking similarity in form between these three monuments. This site at Lagavooren and the other Grooved Ware discoveries in nearby Rathmullan are important in the context of their discovery so close to the Brú na Bóinne complex with its wealth of internationally renowned middle/late Neolithic archaeology. 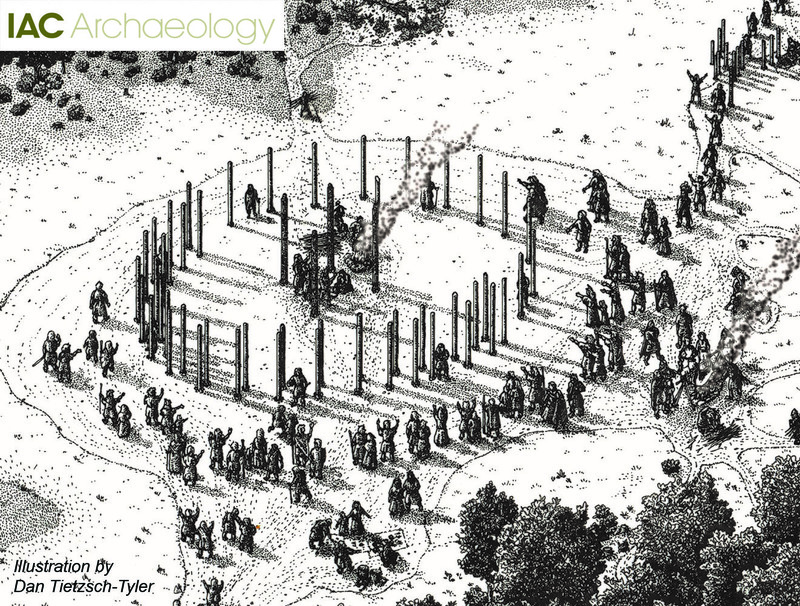 Reconstruction image by Dan Tietzsch-Tyler is based on the timber circle at Kilmainham 3, Kells, Co. Meath. Clarke, L. and Murphy, D. 2002. Excavation of a Bronze Age enclosure (Site 17) at Lagavooren townland, Co. Meath. Ríocht na Midhe XIII, 18–22. Eogan, J. ‘Bettystown. Prehistoric/multi-period site’, in Isabel Bennett (ed. ), Excavations 1998: summary accounts of archaeological excavations in Ireland (Bray, 2000), 161. Hartwell, B. 2002 A Neolithic ceremonial timber complex at Ballynahatty, Co. Down. Antiquity 76, 526–32. Ó’Drisceoil, C. 2009 Excavation of a Late Neolithic Grooved Ware Settlement at Balgatheran, County Louth. County Louth Archaeological and Historical Journal 27, 77–102.